Ready to party hop? 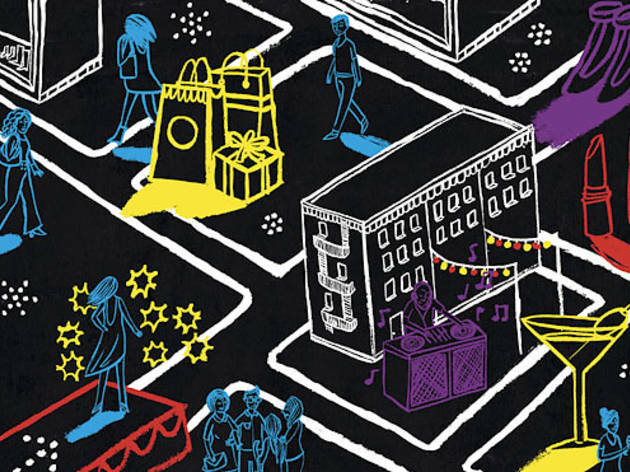 Here’s your guide to all the festivities taking place on one of the biggest shopping nights of the year in Chicago. 900 Shops Actress Ali Larter (Heroes) hosts this mammoth party in one of the Mag Mile’s biggest malls. Look for a fashion show styled by Eric Himel, tastings curated by Groupon, a GlossedandFound.com photo booth and a lot of Champagne. 900 N Michigan (312-915-3916). 6–9pm. Forever 21 It pays to spend at this fast fashion chain. The first 300 customers who spend $40 or more get a Love & Beauty kit. Plus the store amps up the party vibe with a DJ, refreshments and treats. 835 N Michigan Ave (312-202-9103). 6pm. Haberdash This mecca for men’s fashion welcomes stylish guys to check out the latest from Levi’s Made & Crafted line and Red Wing Heritage. Reps from both companies are on hand to talk about each brand, and the Red Wing folks are even bringing along archives that will be displayed for a limited time. Enjoy cocktails made with booze from local distillery Koval, bites from Osteria via Stato and a gift with purchases. 607 N State St (312-624-8551). 6–9pm. Henri Bendel Many stores are offering FNO T-shirts, and Henri Bendel’s version features Swarovski crystal embellishments. Plus, get a free gift with your purchase. 845 N Michigan Ave (312-951-1928). 6–8pm. Macy’s State Street Macy’s gets the party started early with a noon performance from the cast of Million Dollar Quartet. Throughout the day, you’ll have the chance to meet folks from Fashion Star and Real Housewives of New York while you learn about fall trends from three Chicago fashion bloggers and visit Kiva’s PureBeauty nail bar. 111 N State St (312-781-1000). Noon–11pm. Macy’s Water Tower Gifts with purchases, prizes and other incentives are offered throughout the store this evening. Some of the highlights include nail art by AstroWifey, a braid bar and a fall trend preview hosted by the Girls of Lincoln Park blog. 835 N Michigan Ave (312-440-3166). 6–11pm. Moncler This French shop is known for its high-end winter jackets and ski clothing. But tonight, the shop is all about a couple of limited edition T-shirts celebrating the Moncler heritage. The shirts are $35 and available exclusively during Moncler’s FNO cocktail party. R.S.V.P. at monclerchicago@moncler.us. 33 E Oak St (312-361-8573). 5–8pm. Neiman Marcus Bring your appetite to Neiman’s tonight: RPM, Paris Club, More Cupcakes and others are offering tastings on the third and fourth floors. Grab a bite before checking out a fall fashion show hosted by Corri McFadden (e-Drop Off). 737 N Michigan Ave (312-642-5900). 6–8pm. Province Local lines Objets d’Envy and Kate Boggiano invade this West Loop restaurant. 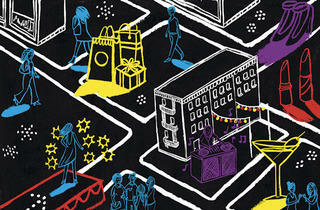 Look for free raffle drawings, deals and a look at the Chicago launch of NUX activewear. And because this takes place in a restaurant, expect bites from chef Randy Zweiban. R.S.V.P. at kirtsen@objetsdenvy.com. 161 N Jefferson St (312-669-9900). 5:30–7:30pm. Sarca Makeup expert Shannon O’Brien stops to offer free eyelash and lip touch-ups. Plus, you can enjoy Champagne, bites and a 20 percent discount. R.S.V.P. to rsvp@shopsarca.com. 710 N Wabash Ave (312-255-0900). Noon–6pm. Water Tower Place The Magnificent Mile Shopping Festival concludes with this party in the mall’s In Fashion Lounge. Expect music, bites from M Burger, special discounts throughout the mall and a chance to win a $500 Water Tower Place gift card. R.S.V.P. at shopwatertower.com/events. 835 N Michigan Ave (312-440-3166). 6–8pm.